Fragnut. Confused? Well so is everyone else at Lumiere Hall Prep when sixteen-year-old Rubie Keane rolls in from Trinidad and Tobago talking her weird lingo. Not that she minds the culture confusion; she’s determined to leave the past behind her and be overlooked—but a certain stoic blue blood is equally as determined to foil her plans. Gil Stromeyer’s offbeat personality initially makes Rubie second-guess his sanity, but she suspects his erratic outbursts of violence mask a deeper issue in his troubled, charmed life. Despite his disturbing behavior, a gradual bond forms between the two. However, on the night of the annual Stromeyer gala, events unfold that leave Rubie stripped of her dignity and kick Gil’s already fragile world off its axis. Both their well-kept secrets are uncovered, but Gil’s revelation proves that sometimes the best remedy for a bad case of lost identity, is a dash of comradery from an ally packed with flavor. Definitely music – specifically original scores from films. My favorites are from The Village, Finding Neverland, Pride & Prejudice, Meet Joe Black and Life as a House. What’s your advice to an aspiring author? I like to call it writer’s diversion lol. Suddenly my idea isn’t as exciting as I initially thought, so then I drift into another storyboard. But absence makes the heart grow fonder and I usually return to book 1 with full force after a few weeks. For normal writers block I force myself to write 1000 words a day even if it’s 1000 words of crap. 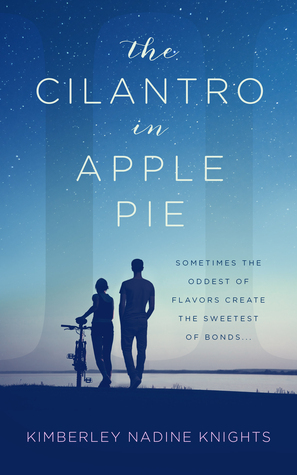 Who is your favorite character in The Cilantro in Apple Pie? Believe it or not it’s the male protagonist Gil. His character was so much fun to develop because he’s such a drastic departure from anything I know firsthand. He’s flawed in so many ways but for the right reasons…so you can’t help but root for him. Could you describe your definition of a perfect writing day? I can’t write in the day…only at night. Guess that makes me some kind of literary vampire – but my ideal writing ‘time-period’ would be locked in a cold room with a desk and my laptop, burning the midnight oil till 6am with my score mp3’s and a cup of java. 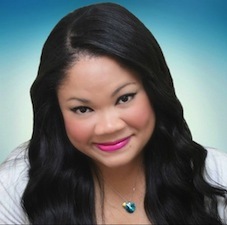 Kimberley Nadine Knights knew when she kept willingly opting out of parties so she could stay home and write instead, that she was destined to be an author. Born and raised in the tropical twin islands of Trinidad & Tobago, when this Caribbean girl isn't creating new plotlines for her ever growing lineup of fictional characters, she spends her time strumming her guitar to indie rock songs and snapping once in a lifetime photos halfway across the globe in countries such as Estonia, Finland, Sweden, Denmark and France. She's an avid fan of The Walking Dead series and firmly believes that The Food Network should consider her being a judge on the next Chopped challenge.